Beginning with the October 2017 issue, the ITG Journal cover has a new look! 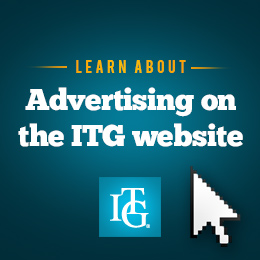 In an effort to modernize the ITG brand, we have designed a new color cover with photos of key people from each issue. Because the print costs of moving to a full-color cover are extensive, we are experimenting with this new look on a trial basis at first, and the new design is being used for at least this first year on the electronic PDF version only, while the traditional cover design remains on the print version. We are anxious to learn the opinions of all interested people, so please take a look at this new design and let us know your thoughts by filling out this short questionnaire. Thanks!